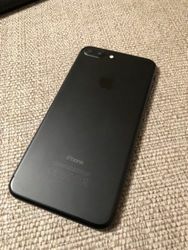 Apple IPhone 7 Plus In Matte Black 32GB which is unlocked to any Network. This comes fully boxed with all manuals and brand new set of headphones and charger. A Wallet style case is also included in the sale. Phone is in immaculate condition.